Swivel Saucer, Cupholder Goodness | OhGizmo! By David Ponce on 07/20/05 • Leave a comment! A while back we posted about a french fry holder that fit in your car’s cupholder. Well, why limit yourself to fries? 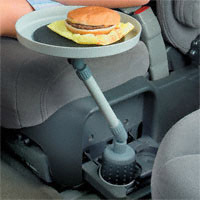 Get the Swivel Saucer and enjoy your entire McMeal, right behind the wheel. It’ll fit in most standard size holders, rotates 360 degrees and has a no-slip rubberized base grip to help it stay in place. It’ll set you back all of $16, right here. Story VIA Bookofjoe.